Lately I've been planning to make some larger carbon printing tissue for prints in the 16x20 range. That means that I had outgrown the surface area of my old jig for pouring out glop. I also wanted to start making thicker tissue again, and pour out glop at a wet height of about 1mm. My favorite surface for this is glass. It's perfectly flat, cleans up well, is portable, and absorbs the heat of freshly poured glop to allow it to set up quickly. This new glass jig allows me to make tissues up to 24x24 in size. Instead of going for a magnetic surface that allows me to use magnetic strips to dam the liquid glop, I am using 1/4 inch strips of glass backed with electrical tape. The glass strips are easily arranged to form a dam for sheets of different sizes. The tackiness of the electrical tape and the weight of the strips is enough to keep the strips from moving once they are set down. I had considered rubber strips, but the electrical tape works just fine. The base surface is a 1/2 inch thick table top I bought in Craigslist for 60.00. The base is heavy but easily portable and can be easily leveled with shims if necessary. 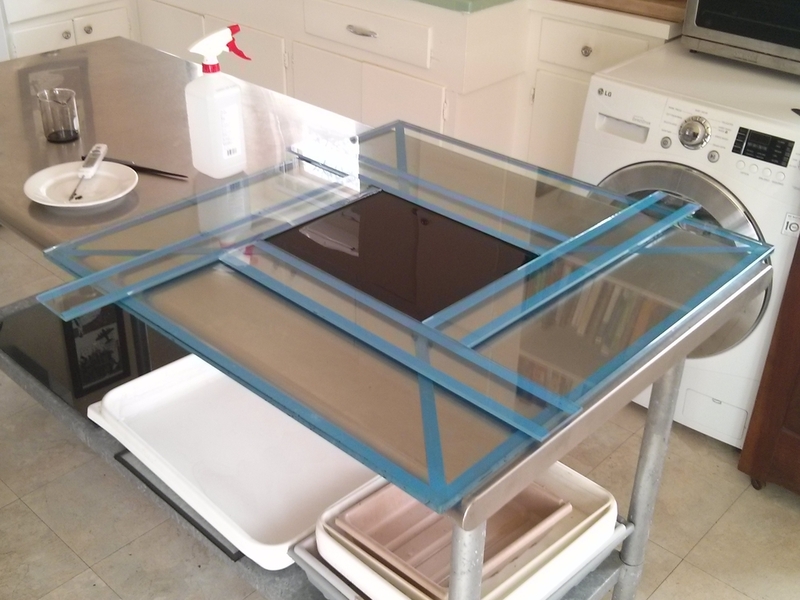 This allows me to set up the jig in my kitchen where I like making materials the most. I just set it on my work table and put it away when I am done. The only limitation of using the glass strips to dam the glop is that they will always be much thicker than the wet height of the tissue. This means that you cannot level the tissue with a metal rod. You have to set your thickness by pouring out the exact volume. However, so far this has worked out well. The glop has to be very hot, but I can effectively spread it out with a comb to get a smooth and level coat. A perfect 11x14 sheet ready to dry. If you like set your tissue thickness by pouring by volume, this jig works like a charm and cleans up nicely.